The Xclaim 10ft Kit 03 stretch fabric popup display is a lightweight and hassle free way to add a unique dimension to your tradeshow booth. With magnetic clamps for stability and graphics pre-attached to the frame, the 10 ft Xclaim offers one of the easiest and fastest setup times available. Graphics are easily changeable via push-fit hubs offering a multitude of placement options based on your preference. Xclaim displays are portable, durable and offer a myriad of possibilities. 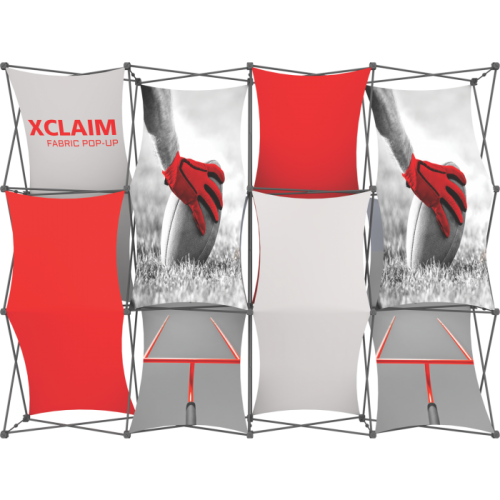 Make a powerful statement at your next show with the Xclaim!